There are many issues that the candidates for the next mayor of Philadelphia are dealing with as they continue their campaigns. Some examples of issues that many citizens are concerned with include crime, taxes and jobs. Another major issue, one that seems to be at the forefront of the upcoming election is education. If one would ask current Philadelphia Mayor Michael Nutter, he would more than likely tell them that education is always an issue in this city. The School District of Philadelphia operates with a $2.5 billion budget for over 220,000 students. This year, the school district is facing an $80 million deficit, and each candidate seems to have a different plan on how to deal with that deficit, as does current Mayor Nutter. Mayor Nutter’s plan to deal with the school funding deficit calls for a raise in property taxes in the city, a plan that is opposed by all of the mayoral candidates. At the heart of the education issue is the debate between public schools and charter schools, and which type should receive how much of the school district’s budget. Approximately 31 percent of the schools that are part of the School District of Philadelphia are charter schools, and the remainder are public schools. On the surface, it would appear that the candidates are attempting to sweep this debate under the rug. Democratic candidate Anthony Hardy Williams has said publicly that he is tired of beating up on one type of school. This is despite Williams’s campaign being backed by the Susquehanna International Group, which is known to be a proponent of charter schools. Earlier on in the process, Williams also stated that he would be willing to accept a $35 million donation from the Philadelphia School Partnership, a non-profit advocacy group that is not associated with the school district. This $35 million donation would go towards increasing the number of seats in the city’s charter schools. This suggests that Williams is on the pro-charter schools side of the debate, while some of his opponents, most notably Jim Kenney, are pro-public schools. Kenney and Williams are on completely opposite ends of the debate when it comes to expanding charter schools. These community schools would be public schools placed in certain communities, and become centers for social and medical services for students and their families. When Williams said he would accept a $35 million donation to increase the seats in charter schools, Kenney and other candidates opposed, saying that any donation should go towards charter schools and public schools equally. The public versus charter debate is a hotly contested one, and many citizens have strong feelings for one particular type of school. 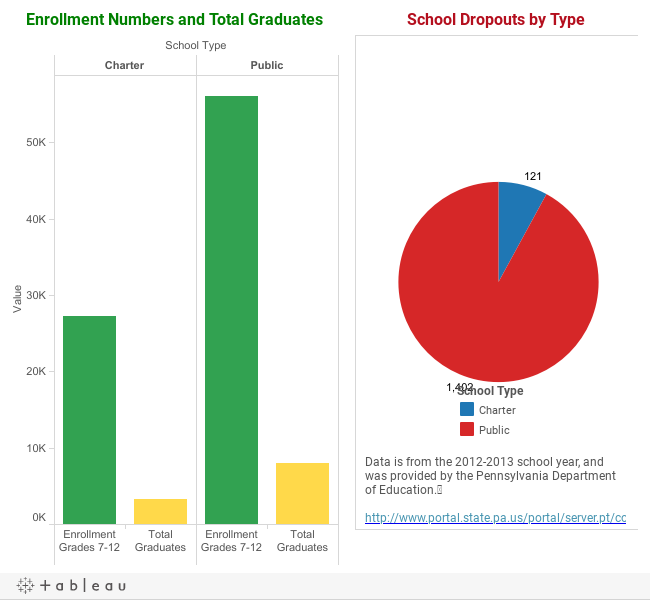 Below is a visualization showing enrollment numbers, graduation numbers and dropout numbers for both public and charter schools in the 2012-2013 school year. For these statistics, only schools that offer grades 7 through 12 were included, as those are the grades when some students will begin to potentially choose to drop out of school. In Philadelphia in 2012-2013, public schools had a little more than twice as many 7th-12th grade students as charter schools. That is not much of a surprise, as charter schools have just recently started to grow in the city of Philadelphia. The one common perception is that charter schools provide a better quality education, but some of the numbers, specifically graduation numbers, suggest otherwise. As the visualization shows, 8,029 students graduated from public schools, compared to just 3,337 from charter schools. The number of public school graduates is greater on its own, but also when total enrollment is involved. According to the data, 14.5 percent of public school students graduated, while just 12 percent of charter school students graduated. That does not seem like a big disparity, but when it comes to talking about tens of thousands of students, that’s very notable. The piece of information that is positive for those who are pro-charter school is the dropout data. 1,402 students dropped out of public schools in 2012-2013. That is 92 percent of all dropouts that school year. Students who attend charter schools tend to stay there, and graduate in most cases. While that information is positive for charter schools on the surface, it also makes a case for funding to go to public schools. In Philadelphia, there are public schools on the brink of closing. Many of the facilities need improvements, and the students do not receive the funding necessary for them to succeed. All of the mayoral candidates agree that school funding is a major issue, but each has a different plan of attack. Some feel that adding charter schools is the way to go, while others would rather improve the current public schools. When it comes to data and statistics, it appears that making improvements to the public schools is where the funding should go. Next Next post: Who’s Got The Buck$?